Alive and Well Communities recognize the impact of toxic stress and trauma on the health and well-being of our communities. Our communities are working to ask new questions, build common understanding, and create pathways to healing. While trauma does not discriminate and impacts all communities, our work centers the impact of the trauma of discrimination, which science increasingly shows has devastating health impacts. With all of this knowledge, we seek to build the will to change and to activate communities to heal. Alive and Well Communities is a nonprofit organization, based in Missouri, focused on activating communities in Missouri, Kansas and Illinois to address the trauma experienced by their residents. We are dedicated to shifting cultures and systems and helping people develop pathways to healing, well-being and equity. We began as two separate initiatives – Trauma Matters KC and Alive and Well STL. In 2017, we came together to form Alive and Well Communities, an independent 501c3. The work began in 2013 in Kansas City when a group of volunteers started Trauma Matters KC (TMKC) to create a trauma-informed, resilient community. In 2015, in partnership with the Chamber of Commerce of Greater Kansas City, TMKC applied for and was selected as a nation-wide Mobilizing Action for Resilient Communities (MARC) grant recipient, which operated under the name Resilient KC. In August 2017, as the Resilient KC grant was ending, the stakeholders of Trauma Matters KC decided to partner with Alive and Well STL to form Alive and Well Communities. In St. Louis, the work began in 2014 as a public awareness campaign, led by the St. Louis Regional Health Commission, to address the severe, long-term health risks of stress and trauma in the St. Louis region. The campaign quickly became a community-wide effort to change the question from “What’s wrong with you?” to “What’s happened to you?”. To move the campaign forward throughout the St. Louis region, partnerships with key media outlets were essential. Those partnerships included KSDK NewsChannel 5, St. Louis American, Hot 104.1, Old School 95.5 and RareGem Productions. The campaign successfully generated more than 190 million impressions and 44,000 Facebook followers resulting in more than 500 trainings to more than 20,000 people in the region. Both efforts were supported by local funders who continue to be important to the work today. These funders include the Missouri Foundation for Health, St. Louis Mental Health Board, the Health Care Foundation of Greater Kansas City and the REACH Health Care Foundation. The leadership of the Missouri Trauma Round Table, sponsored by the Missouri Department of Mental Health, also has been critical to informing the work as it has grown throughout Missouri and beyond. In 2017, the initiatives in Kansas City and St. Louis merged to form Alive and Well Communities, becoming a leading voice on trauma and toxic stress, its impact on communities and the potential paths to healing. 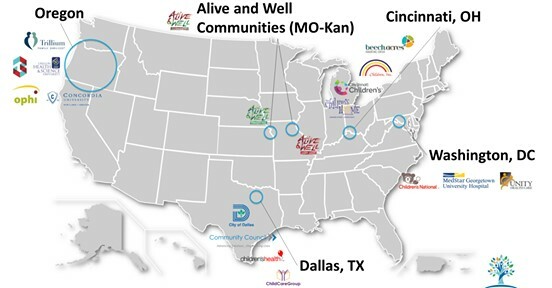 In 2018, Alive and Well Communities joined the Building Community Resilience Collaborative of the Sumner M. Redstone Global Center for Prevention and Wellness at George Washington University’s Milken Institute School of Public Health, working with four other communities across the country to address Adverse Childhood Experiences and Adverse Community Environments – The Pair of ACEs.